CLEVELAND (AP) — The Steelers survived one week without Le’Veon Bell. Maybe they can do it again. Making his first NFL start, James Conner helped Pittsburgh forget that Bell — the team’s disgruntled star running back — isn’t around and may not be back anytime soon. Conner scored two touchdowns, rushed for 135 yards and added 57 more on five catches as the Steelers escaped Sunday with a 21-21 tie against the Cleveland Browns, who ended their 17-game losing streak without winning. 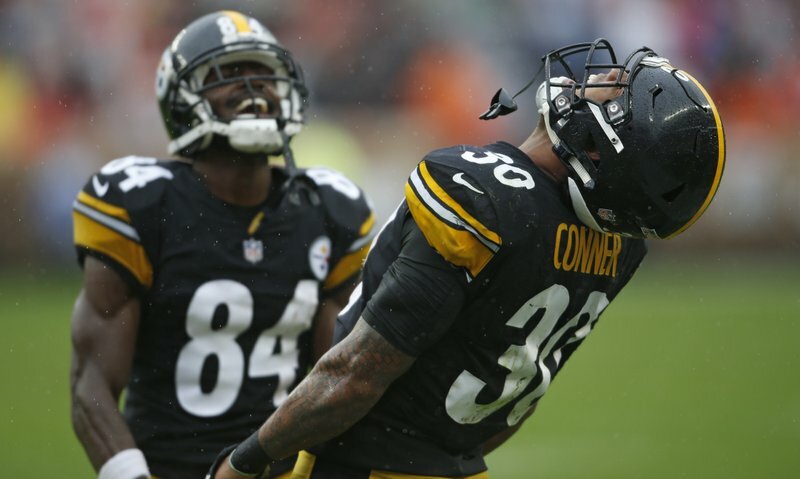 Conner was more than an adequate fill-in for Bell, who remains separated from the Steelers in an ugly contract dispute. While his teammates slopped around in the rain at FirstEnergy Stadium, Bell continued his holdout in South Florida as his replacement gave the Steelers hope they’ll be able to withstand not having one of their biggest stars. Conner could be their newest one. Conner scored on a 4-yard run in the second quarter and added a 22-yarder in the fourth as the Steelers opened a 21-7 lead that appeared safe. However, as Pittsburgh appeared on the verge of putting the Browns away, Conner had his lone blemish on an otherwise stellar day. Running right, Conner got stripped by Browns end Myles Garrett and his fumble led to the Browns quickly scoring two touchdowns in the final 7:32 to force overtime. Cleveland had a chance to win it, but linebacker T.J. Watt added a blocked field goal to his four-sack game by getting a hand on Zane Gonzalez’s 43-yard field-goal attempt with 9 seconds left. Bell’s messy situation cast a shadow over the Steelers all week, bringing a distraction to a team that usually avoids drama. The stand-off could last for a while, and if it does, Pittsburgh coach Mike Tomlin, his staff and the Steelers have to feel better about what Conner can provide. On a day when quarterback Ben Roethlisberger struggled throwing three interceptions and fumbling twice, Conner was solid and steady. It looked that way. Conner patiently looked for running lanes, taking what Cleveland’s defense gave him and never trying to do too much. The 23-year-old finished with 192 total yards, matching Bell’s best game from last season. Conner took it all in stride. Following the game, he casually accepted congratulations while dressing and came across as composed off the field as he was on it. “It is what I expect,” he said of his performance. “It’s the mentality of our offense. We feel like we’re going to run the ball when we want to run the ball so I know the mentality of those guys up front. I knew the lanes were going to be there. I knew today was going to be a good day on the ground, just not enough to win.